Environment Minister Robyn Parker recently unveiled “Barrel Roll” by American artist Peter Lundberg, the winning entrant in the famous Sculpture by the Sea, Bondi 2012 exhibition, currently on display at the Domain in the Royal Botanic Garden, Sydney. With Barrel Roll now an integral part of the Domain and Royal Botanic Garden’s already impressive sculpture collection, Ms Parker paid tribute to the modern piece, which adds to the historic collection dating back to the 1870s. “The famous Bondi exhibition attracted American artist Peter Lundberg to Australia and it is our local surrounds, people, environment and his personal experience gained here that inspired this striking piece,” Ms Parker said. Locals and tourists will enjoy visiting the Domain and Royal Botanic Garden to view the existing 57 piece sculpture collection that has been enhanced by the Sculpture by the Sea, Bondi winners. 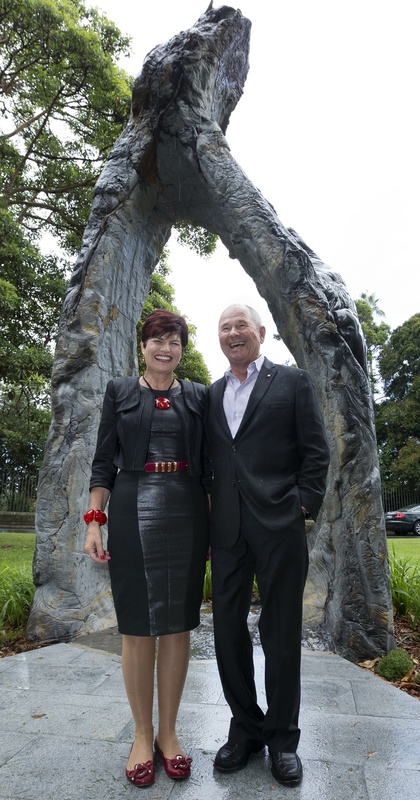 In December 2010, the Balnaves Foundation that funds the prize for the winner of the Bondi exhibition, agreed with the Royal Botanic Gardens and Domain Trust to donate each year’s winning sculpture to the Trust, commencing with the 2009 work by May Barrie. Each winning sculpture from Sculpture by the Sea, Bondi will be appropriately placed within the Garden or Domain. After a 10 year residency beside the harbour, some works will be moved to the sculpture collections at the Australian Botanic Garden, Mount Annan and the Blue Mountains Botanic Garden, Mount Tomah. Chairman of the Balnaves Foundation, Neil Balnaves, said “Sculpture by the Sea, Bondi has become one of the most popular events on Sydney’s art calendar. Over a two week period each year nearly 500,000 people walk the cliffs between Bondi and Tamarama to enjoy the sculptures. We were excited by the idea of taking the winners from each exhibition and placing them in one location where the public could enjoy them all year round. The Royal Botanic Garden, Sydney is the perfect location”. The Balnaves Foundation is a private philanthropic fund that supports organisations that aim to create a better Australia through education, medicine and the arts with a focus on young people, the disadvantaged and Indigenous communities. This entry was posted on Saturday, April 13th, 2013 at 9:25 am and is filed under Uncategorized. You can follow any responses to this entry through the RSS 2.0 feed. You can leave a response, or trackback from your own site.